Buying a car can be a stressful process. There are many models to choose from, and, once you determine the car of your dreams (or at least your budget), you could end up paying thousands too much if you don't negotiate correctly. Luckily, there are a number of resources on the Internet that provide guidance on what you should be spending for a vehicle and put you, not the dealer, in control of the negotiation process. All without the need to set foot in a showroom. Before you buy, it is critical to arm yourself with information about the actual dealer cost. Dealer cost is based on the invoice cost for the vehicle and any options, less any current manufacturer to dealer incentives and "holdbacks," which are special payments dealers receive for each vehicle they sell. Never negotiate down from the inflated MSRP (the Manufacturer's Suggested Retail Price, often called the "sticker" price); this is a trick dealers use to make you think you're getting a deal, but it ignores the huge mark-up the MSRP represents over the dealer cost. Consumer Reports offers a detailed pricing reports that gives you complete insight into dealer cost through their Cars Best Deals Plus service; it is available to members and costs $13 for an annual subscription. Edmunds.com offers much the same information at no cost on their site. 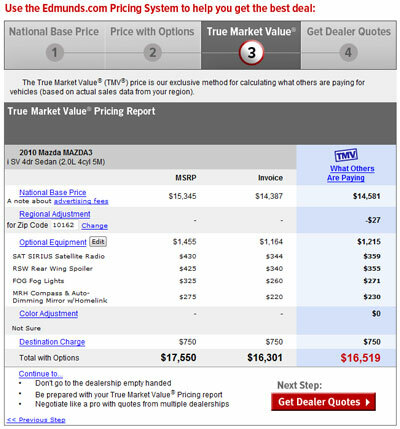 Edmunds.com also has a special feature it calls the True Market Value (TMV), which takes into account various factors, such as invoice price, current supply and demand, and actual transaction price data to provide an estimate for what you should be paying for a vehicle in your area. Finally, check around for owner forums (just Google search for the model and make of your desired car and "forum"). Often recent buyers will discuss the prices they were able to negotiate and the dealers who offered it to them. Once you understand the price you should be paying, Edmunds.com will let you submit a quote request to up to five dealers, right over the Internet. No need to go into the dealership and listen to a hardsell from some shady salesperson. If you do contact dealers directly, do so by email and make sure that you are talking to the "Internet sales manager." Every dealer has one and he or she will have the most flexibility to give you the best price with the least hassle. The Internet sales manager can also arrange test drives, which, of course, is a must before you buy any vehicle. 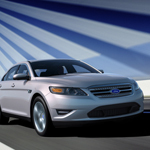 If you don't want to negotiate at all, CarsDirect.com has pre-negotiated prices available through their network of 3,000 dealers, sometimes at prices lower than the Edmunds.com TMV, so it's worth checking both sites. If you're planning to lease your vehicle, negotiating the price is just as important. The monthly lease cost you see advertised in the newspaper or at the dealership is almost always based on the car's sticker or MRSP price. Negotiate down the price, and you're also negotiating down the basis for the monthly lease payments. However, lease contracts can be quite complex and a number of factors will influence the amount of your payment. We recommend that you check out Edmunds.com's leasing tips and calculator to make sure you're getting the right deal. Good luck and have fun with your new vehicle!